Open the Pocoso start page on the laptop that is used for recording the Poomsae scores and click on "Start Demo Mode"
In the upper area of the screen you can define how many judges will score the competition during demo mode. Valid entries are 1-7. When less than 4 judges are selected, the "Ignore highest" and "Ignore lowest" switches will be deactivated automatically. When those switches are activated, the highest / lowest scores will be ignored for the calculated average score. Enter the number of participants for your competition in the "# Starters" field. 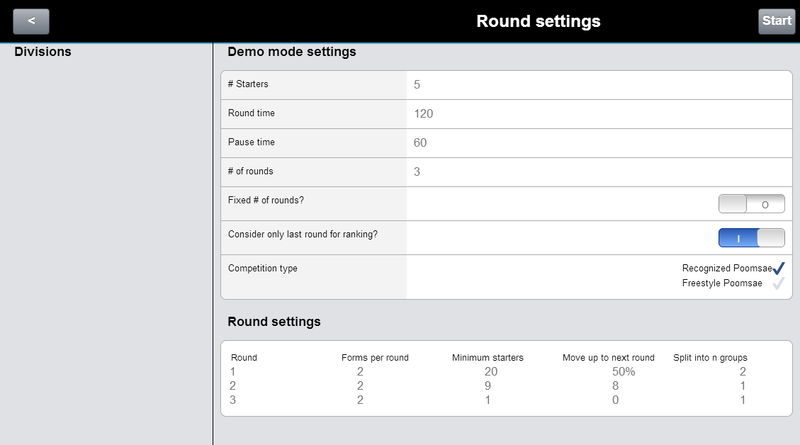 Enter the maximum number of rounds for your competition in the "# of rounds" field. In the above example the competition will have a maximum number of 3 rounds (preliminary, semifinal, final). If "Fixed # of rounds?" is deactivated like in the screenshot above, then the actual number of rounds will be based on the number of starters and the round settings defined below. If this switch is activated, then the maximum number of rounds is equal to the value entered in "# of rounds". If "Consider only last round for ranking?" is activated, then only the scores of the last competition round will be used to calculate the ranking.If this switch is deactivated, then the average score of all rounds will be used to calculate the final ranking (eg. scores of all 3 rounds together). In the "Competition type" box you can select if a regular poomsae competition or a freestyle competition will be run. Round: The highest round number is always the final round. In the example above round 1 is the preliminary round, round 2 is the semifinal and round 3 is the final. Forms per round: This value defines how many poomsae forms one participant has to run in this round. Minimum starters: Defines how many starters have to be participating in this competition, so that this round will be run. If there are 24 starters in this competition, then 3 rounds will be run. If there are only 9 starters, then it would start with the semifinal right away. So only two rounds would be run. If only 5 competitors have registered for this competition, then we would start with the final round already. Move up to next round: Defines how many starters move up to the next round. The value can be a percentage or a fixed value. In the above example, the best 50% will move from the preliminary round to the semifinal and the best 8 will move from the preliminary round to the final round. Split into n groups: This setting will split the starters into multiple starter groups. This feature is only useful if a tournament is run on multiple competition areas. In this case two starter groups could be run in parallel on two competition areas. When you've entered all your settings, click on the "Start" button in the upper right corner to continue. On the next screen you can see that Pocoso has generated a starter list for you. The number of starters is based on the value you've entered on the previous screen. When you click on the "Start" button in the upper right corner again, you can start recording Poomsae scores for the selected starter. 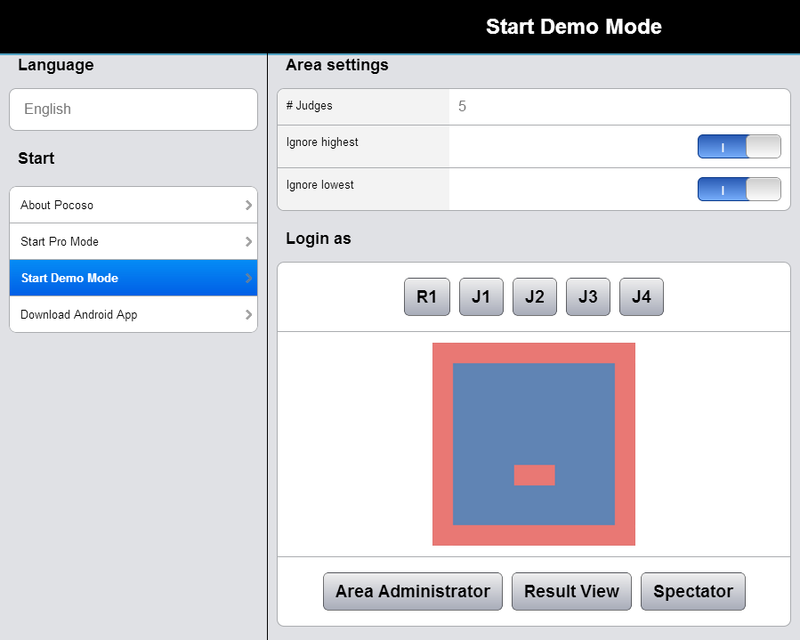 Now you can go ahead and start the demo mode on all connected Pocoso tablets, that will be used by the corresponding judges. 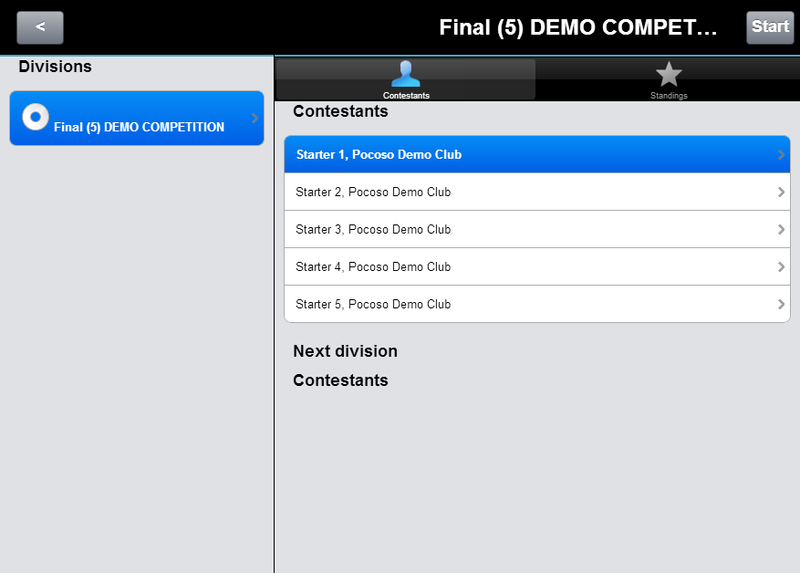 Just select "Start Demo mode" on their Pocoso app and the tap on the correct judge position (R1 or J1 or J2 or ...).